This was such a dramatic read (or rather an audiobook, in my case), filled with many ups and downs, intrigues of the French court, war in the Scottish Highlands, and as always, an epic love story that spans centuries. Hesitantly, I once again immersed myself into the world of Outlander, and once again I’m happy that I did. It certainly didn’t disappoint. I say, I was hesitant at first, as from the reviews I’ve seen many have marked this installment as their least favorite in the series; and perhaps, I found it wordy at times myself. Wrapped in the court intrigue and war this was in contrast to the first installment, where life seemed somehow simpler, different for our heroes, but nonetheless I craved to know more of the story. I find it hard to simply describe all of the colorful events that take place throughout this novel, so I’ll refrain from any attempts to summarize it here. However, I found the “framed” structure of the story quite interesting. In the beginning the story transports us to 1968 Scotland where we once again find Claire, 20 years past her second trip through the stones. 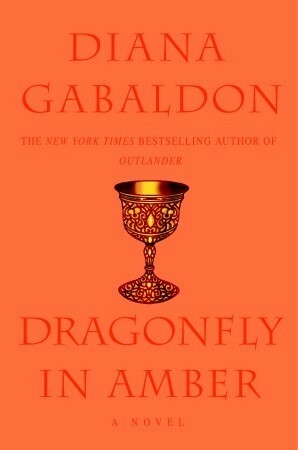 As I began Dragonfly in Amber shortly after finishing the first novel, I was taken aback. I have expected to pick up right where Claire and Jamie have left us, but instead we got a story within a story. And in turn, we are essentially given an outcome of this novel upfront, which is something that has put many readers off. In my opinion knowing the end does not usually prevent me from enjoying the story, so I didn’t mind it as much. Conversely, it took some time getting used to present-day, and as I did so, we were once again in 1744/1745. There was plenty of story here. From historical events, details and thorough descriptions, to present-day happenings of Claire’s life, surprising deaths, secret loves, and Jack Randall once more – it seemed overwhelming. I felt there were several books confined in this novel, each keen to spill more secrets, but somehow at the end, still not enough. Ms. Gabaldon certainly knows how to entice and captivate her readers, and I’m very much on the hook as I eagerly keep going down this rabbit hole and onto the Voyager.